It's been a wonderful Summer but the road is calling our names. In case you can’t tell I’m singing these words. After a year on the plains and in the desert we were happy to see the beach. Fred and I had a fantastic Summer in New York. We camped and had outings with our grandsons, spent time with my Mom, enjoyed the company of our daughters, and spent some time with extended family. We got back to the coast enjoying the beaches of Maine and northern Massachusetts. Somehow there was time to dust off our construction and gardening skills as the Lake George house foyer got a facelift and major pruning was accomplished outside. 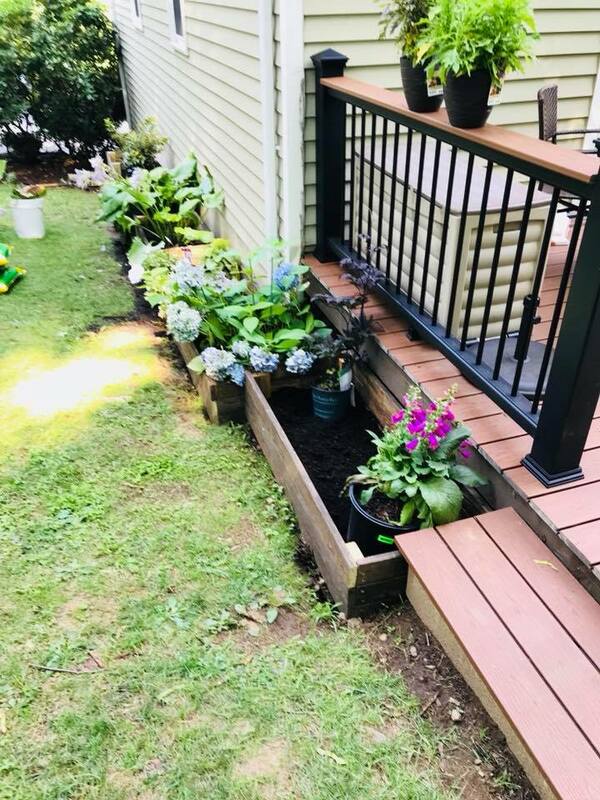 Melissa and Clay's new deck and flower boxes. A new deck and flower boxes were completed at the Connecticut country house and the Behemoth got new window treatments. 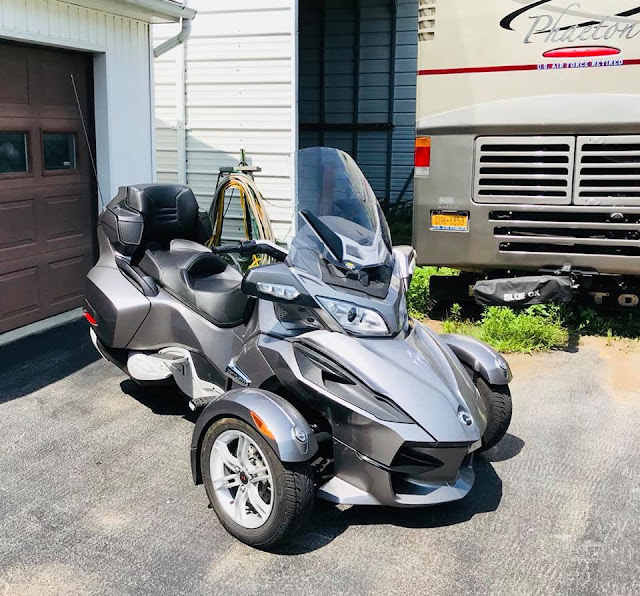 Fred checked another item off his Bucket list when he acquired a Can Am Spyder that he has been wanting for a long time. He even got to attend a Spyder Rally in Queensbury at the beginning of September going on a couple of rides with large groups. Our first stop was at West Point Military Academy’s Round Pond Recreation Facility where we enjoyed a couple of nights at the top of the mountain. 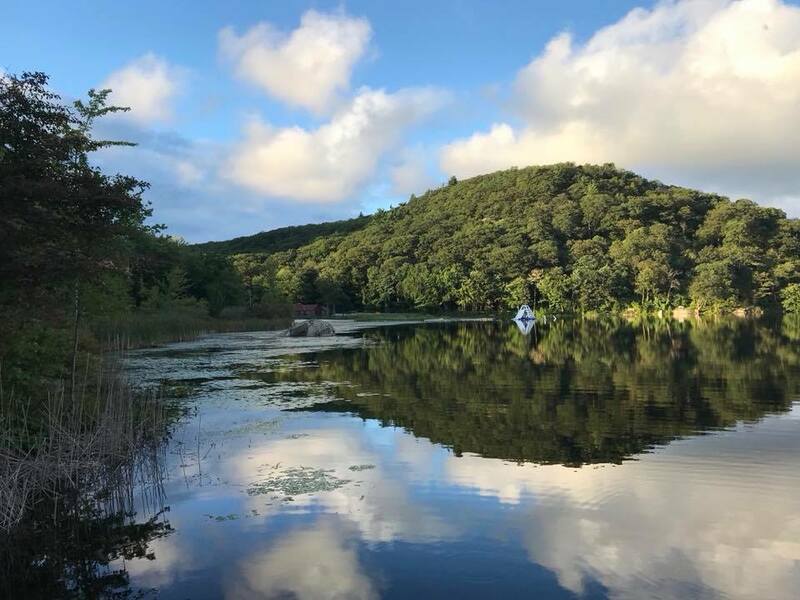 Round Pond is a beautiful site. The roads are narrow, steep and twisty to get there but worth the effort. We were pleased to meet neighbors Karen and Bill who are new to the full time RV lifestyle. We met as they were dealing with a broken cable on one of the slides of their rig. We dragged out Nick Russell’s Guide to RV Good Guys to try and find them some help. You meet the nicest people in military RV parks and we were happy to read a few days later that they found a temporary solution to hold them over until the needed repairs could be done by an RV Good Guy in Virginia. 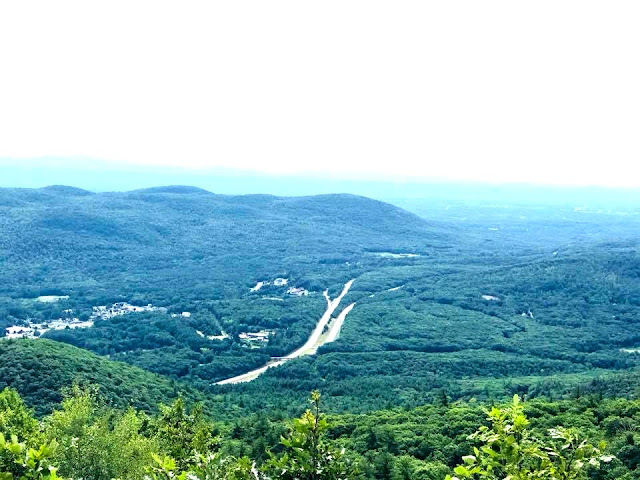 We had one day to devote to sightseeing and spent it in the Historic Huguenot district of New Paltz, New York. The Huguenot’s were Protestants who emigrated from France to the New World in the 1600’s seeking the freedom to worship as they chose. Twelve families settled in the Hudson River Valley in 1677 after purchasing 30,000 acres from the Esopus Indian Tribes. The 12 families who formed the town of New Paltz are referred to as patentees. Names common to the Capital District and Hudson Valley like Deyo, LeFevre, Hasbrouck, Dubois, and Freer originated here. A portion of Huguenot Street consists of 6 stone houses built before 1720. Those houses are protected as a National Historic Landmark. Each home is a museum preserving the history of a patentee family. The families built their original homes of wood, replacing them over the next 40 years with stone houses in what is now called rural Colonial Dutch architecture. Gambled roofs and curved eaves in single story houses built of local stone are hallmarks of that distinctive style. We walked the hilly street along the banks of the Wallkill River admiring the stone structures and beautiful gardens. There is a replica wigwam on the lawn of the Dubois Fort representing the Munsee Esopus people who lived in this region prior to European settlement. The wigwam was constructed using authentic techniques and locally sourced materials to make an accurate presentation. There is a stone church (reconstructed in 1972) and a small cemetery where some of the early members of the community were laid to rest. The walking tour was pet friendly since we opted not to walk through the inside of the homes. Rascal enjoyed it and afterward walked with us up the hill to Main Street for lunch at Mudd Puddle Coffee Roasters. Mudd Puddle is right next door to Paws of Distinction so he enjoyed chicken and sweet potato dog treats. We left Round Pond on Friday morning. Army fans were already starting to arrive for Saturdays big game against the Rainbow Warriers of Hawaii. Grills were being set up and long tables were set out under shade canopys. I bet it was a fun weekend at the Academy. Next stop Amish Country, Lancaster County Pennsylvania. You guys had a busy summer! Glad to see you back out on the road, Bonnie!